Title: Tricks are for Kids. 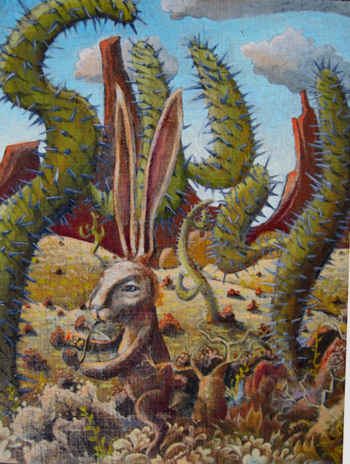 Medium: Oil on Panel, Cardboard Frame Date: 02/10/2011 Dimensions: 7″ X 5″ Approximate Description: I live in the desert and have a deep affinity for the flora and fauna the landscape and the sky. I'm fascinated by Jackrabbits. Years ago there was one who lived near my house. he was the largest specimen I ever saw. He probably weighed in at thirty pounds. We was as big as a dog. In this painting I tried to imagine him in my own slightly humorous way. Unfortunately this painting sold before I was able to get it photographed properly. It is now in the Cherry Collection.